I bought this item and other stuff in the same order. Customer care was amazing and even doing some exceptions for me... Reading the other reviews, they are correct.... great good looking, quality materials are really good, the "looks" that it give to your bike is amazing..
TST sells also the converters you need, so it will turn also your wiring into a plug and play with their products... Because i was so impulsive, i didnt took time to verify my connectors and also I didn't bought the harness and took me more time to install it because I have to cut wires to complete the installation.. Advantages: fast shipping, great product... price was fair. These signals are incredible! The fit is flush with the fairing and the LEDs are very bright. I ordered them with a clear lens and orange led and the bike looks very clean. The installation was a breeze. You take three minor screws off the inside panel of the front fairing and it's all plug and play from there. This youtube video will show you what to do even though it's for a different flushmount signal, the install is nearly identical: https://youtu.be/89jDw2WRZ5I. Thanks for the review, Brian! We simply wanted to acknowledge an installation video for the HALO-GTR system is anticipated for upload between 2/13 and 2/17. Thank you for helping fellow riders in the meantime but recognizing the install is 1) simple, and 2) similar to the standard LED flushmount's install. Advantages: Plug and play flushmount look with bright LEDs and always on signal markers. Looks incredible and easy to install. Disadvantages: When installing, make sure you tuck the inside panel back into the fairing before setting the rivets back in place. The wire on the right side when you sit on the bike is a little long and may rest on the radiator cap. I recommend using some electrical tape and taping it to the other wires in the run to lift if off your radiator. Adam, I'm glad we were able to get this issue resolved with you in a matter of minutes. 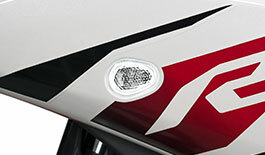 Enjoy your new R3 HALO signals! Awesome! I have several TST accessories now for my R3 and the quality and support has been great. The installation videos are top notch. Thanks! This is an amazing product. It’s amazing how much better it makes my R3 look. I’m very happy with my purchase. The shipping was actually really good too. Me living in Canada, I still got it within a week. Advantages: Makes the bike 100% more noticeable in the dark with the bright halo light. The installation is actually as easy as plug and play. I don’t know a thing about installing parts on a bike and this must have taken me 20 minutes. I ordered these a few days ago. Shipping was super fast, and items came perfectly packaged. The install was super simple, watching the TST videos for install. Once installed the halls are bright and the turn signals even brighter in my opinion. Definitely looks much better then the stock turn signals. I would definitely recommend purchasing the relay so you can slow down the flash light. Install was a breeze, Looks really nice on my bike, But one of the Halo lights doesn't work. Disadvantages: Aside from that one light working, Nothing really. I'm glad we could get that replaced for you! Don't hesitate to contact us and ride safe! Luckily you're definitely covered under our standard 1-year warranty and can get this unit replaced. We're terribly sorry for the error and inconvenience Zach and don't ever hesitate to reach out to us! Great customer Service. Great communication and tracking info. Fast shipping. High quality product, and quality packaging as well. I was very impressed with how bright the Halo lights are. I went with blue halo and smoked lens and could not be happier. The turn signals portion is really bright and very visible. Overall great experience with you guys and would continue to purchase parts from you in the future.